Sloths are really interesting animals. They live in the Neotropics (parts of Central and South America), hang in trees, eat leaves, and move really slow. They generally only come down to the ground to go to the bathroom, which seems like a lot of work when they could just let it fall from the tree, but to each their own I suppose. I just found a paper about sloths that I couldn’t help but share. If poo really grosses you out, or you are currently eating, you probably want to stop here. Consider this a trigger warning. If you are triggered by poo. The gist of this paper is that some researchers found sloths going into their toilet (which is basically a hole in the ground) in order to feed. The researchers weren’t sure if the sloths were getting nutrients from urine, feces, or insect larvae, but they were scooping up material in the latrine and eating it, so either way, it is both interesting and disgusting. There is a surprising amount of nutrients in urine and feces and many animals will feed on them, but sloths are supposed to be mostly vegetarians. The researchers observed a number of sloths doing it, so it was not just one isolated individual. Interestingly, sloths will sometimes eat meat given to them in captivity, so clearly sloths have the ability to eat more than leaves, but whatever they are eating in the latrines, I would say it probably isn’t usually an important part of sloth diets in the wild. Take that as you will, and let us never speak of this again. 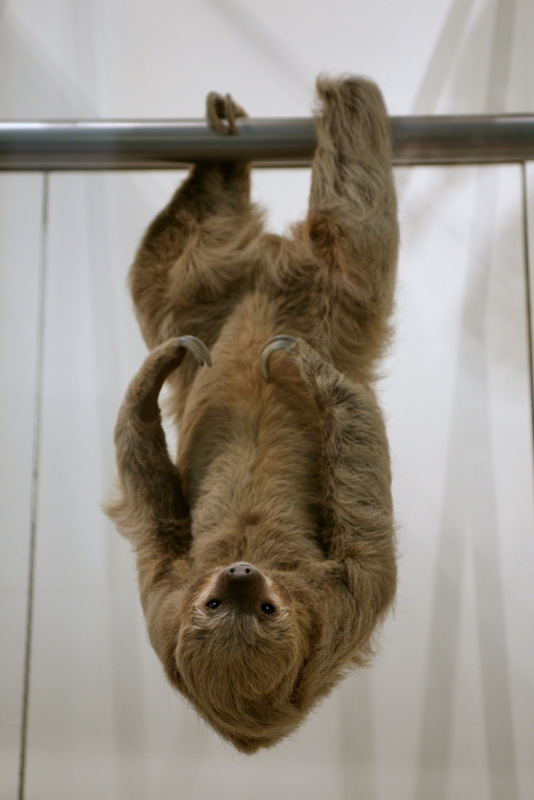 Two-toed sloth staring at you. My post today is going to sound like an essay written by a little kid, because it’s about one of my favorite animals, the fossa. First off, it’s pronounced ‘foo-sah’, because the name comes from Malagasy (the properish term for things from Madagascar), not from Latin. The other common use of the word fossa is in anatomy (meaning a ditch or trench), and is pronounced ‘fahsa’, because it IS Latin. 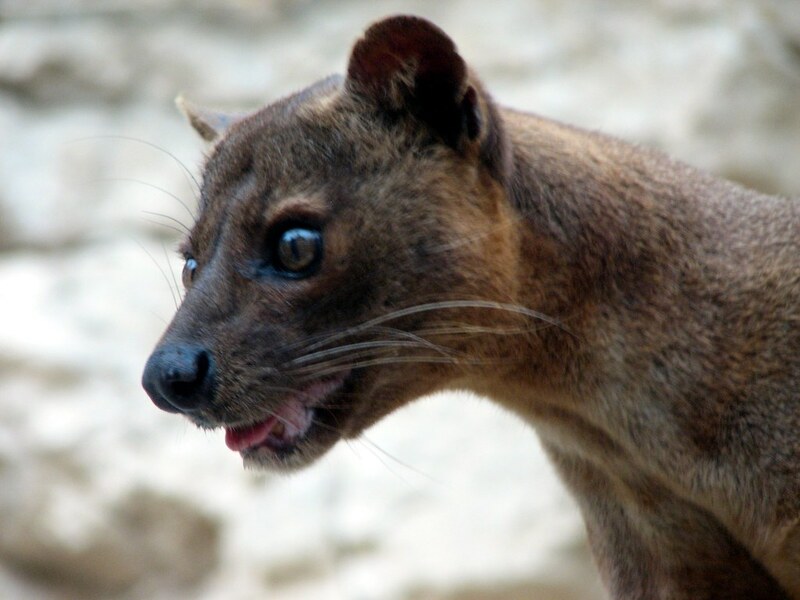 The fossa is the largest member of the family Eupleridae, which makes up the Malagasy carnivores. In this context, when I use the word carnivore, I really mean ‘member of the mammalian order Carnivora, not ‘animal that eats meat’. You could also say ‘Carnivoran’ for this, but that’s just annoying. Euplerids are related to mongooses, civets, and hyenas, all of which are in their own families, and more closely related to cats than dogs (but they are NOT cats). Fossas (remember, not Latin, so this is the plural) are only 2 to 2.5 feet long and weigh maybe 20-25 pounds maximum, with tails as long as their body (so maybe 4-5 feet total), but they are some rough customers for their size. 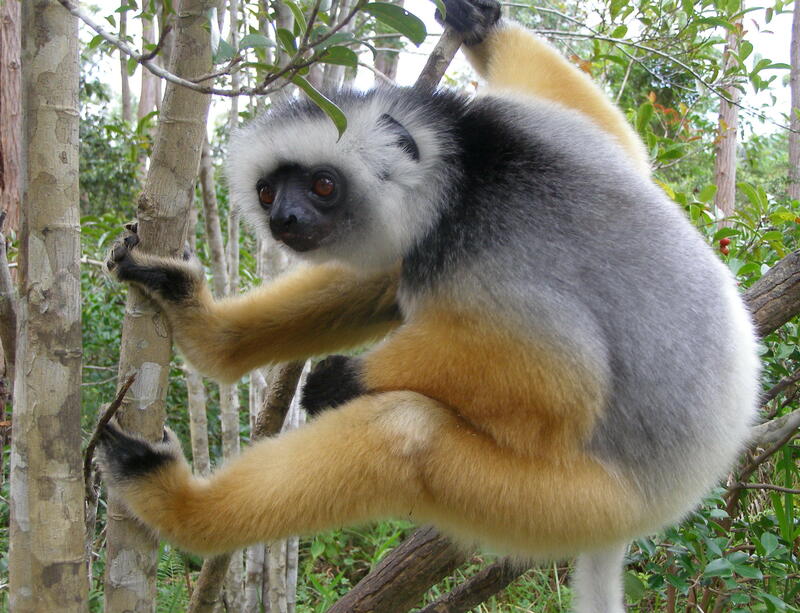 They really like to eat lemurs, another Malagasy-only animal. I’m pretty sure it’s because lemurs are delicious, but you’d have to ask a fossa, because I have yet to eat one. Watching fossas hunt is probably the coolest thing ever, unless you really like lemurs, because when hunting they are basically unrestrained arboreal lemur-murdering machines. Personally, I like fossas better than lemurs, so their tendencies toward serial-killing of lemurs doesn’t bother me that much. A girl’s gotta eat. I really want to eat that lemur. Fossas also have a really crazy mating system. Females mate multiply with groups of males, generally with all the males present. Females also have transiently masculinized genitalia while juveniles (spinescent and enlarged), interestingly reminiscent of the spotted hyena, though not quite as extreme. Another species of fossa, called the giant fossa, went extinct fairly recently, as the remains that have been found are ‘subfossils’, meaning not-yet-fossilized. The giant fossa wasn’t much bigger than our current fossa though, maybe topping out at about 45 pounds. There are many legends about fossas much bigger than this, up to seven and even ten feet long. Awesome, but probably not true. There did used to be some really big lemurs they could eat though, so maybe we’ll find some huge fossa fossils (fossals) sometime in the future. Sadly, fossas are endangered, mostly due to habitat loss, as deforestation is a huge problem in Madagascar. Local people will also kill them because they are thought to attack livestock, and also as bushmeat (food), despite many taboos against eating fossas. 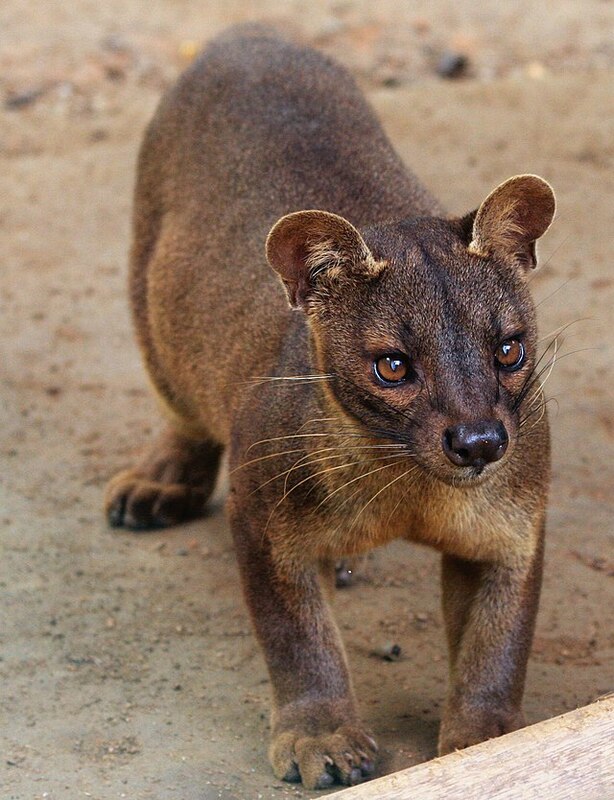 So, here’s to the fossa, a unique, awesome, and unfortunately endangered animal that chows down on lemurs. Personally, I’ve still got my fingers crossed that they’ll find one that’s 10 feet long. What is insulin, and what does it actually do in our bodies? 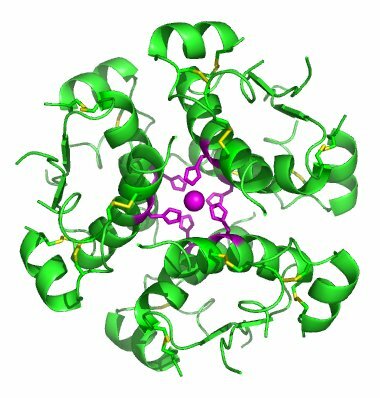 Today I’m going to talk about another hormone, one that is really important both generally in biology, and clinically for many people: insulin. Insulin is a peptide hormone, which means it’s a protein that circulates through our blood and allows different parts of our body to communicate with each other. Peptide hormones cause their effects by binding to partner proteins called receptors that sit on the outside (or across the membranes) of cells. Insulin is produced by special cells in the pancreas called beta cells, and has many important effects effects in the body, although its most important effect is to regulate energy (sugar) intake into cells from blood. Diabetes is probably the most well-known disease in which insulin is involved. People with type 1 diabetes lack the ability to produce insulin because their beta cells have been killed, usually by their own immune system. Type 2 diabetes is a little more complicated – generally years of overproduction of insulin lead the body to become ‘insulin resistant’. Insulin production decreases in many, and cells often respond inappropriately to insulin binding, releasing glucose instead of taking it up. Type 2 diabetes represents about 90% of diabetes cases (1). Figure 3. Insulin signaling allowing glucose transport into the cell, where it is eventually stored as fat. In healthy people, insulin concentrations increase in response to an increase in blood glucose. The rising insulin concentrations lead to cells taking up the glucose, stabilizing levels in the blood. Research suggests that the increased insulin concentrations increase Vmax (the maximum rate of glucose uptake), by providing additional transport sites across the cell membrane (2). 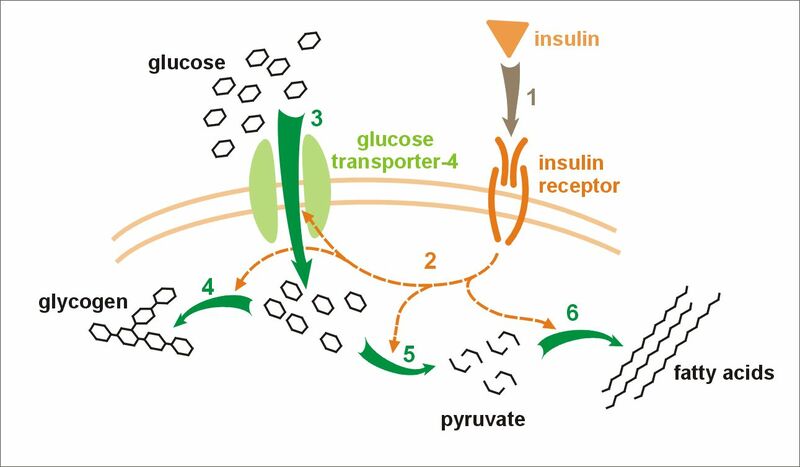 After glucose is taking into cells, it is generally stored as either glycogen (in liver and muscle) to be used for easily accessible energy, or as fat for longer term storage (Figure 3). Other animals have insulin too. Amazingly, insulin and its receptor are so similar among vertebrates that injecting insulin from chickens into humans has an even stronger effect on blood glucose than injecting human insulin. The same thing happens if you inject chicken insulin into fish, frogs, or mice (3). Both the insulin and insulin receptor genes are almost certainly homologous (evolved from the same ancestral gene) among vertebrates. Even insects and worms have insulin-like hormones that are very similar to ours, and many researchers think that these are homologous as well (for example references 4 and 5), making insulin-like peptides well over a billion years old (6). 1. Rorsman, P. (2005) Review: Insulin secretion: function and therapy of pancreatic beta-cells in diabetes. British Journal of Diabetes and Vascular Disease 5 (4) 187-191. 4. Teleman, A.A. (2010) Molecular mechanisms of metabolic regulation by insulin in Drosophila. Biochem. J. 425 13-26. A new paper just came out in Cell Metabolism that is really cool for a couple reasons. Lee et al. (2015) found that a hormone produced by mitochondria, parts of our cells that are important in metabolism and have their own DNA. They called the hormone MOTS-c.
Hormones, remember from earlier posts, are just signaling molecules that circulate in our cells and bodies and have important biological effects. This discovery is especially cool for a couple reasons. The first is that although we know that mitochondria are really important in metabolism, we don’t really know much about signaling molecules that are actually produced by our mitochondria. The second is that the hormone appears to be really conserved among all mammals. This is often seen for hormones whose purpose is so specific, important, and widespread that its difficult for the hormone to even evolve. 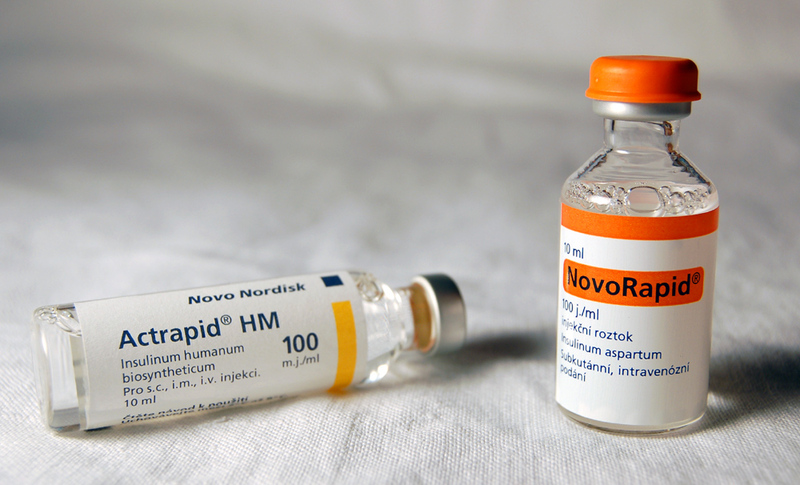 Insulin is another example of a hormone that is very conserved among mammals. A final reason why this discovery is so cool is that MOTS-c seems to have really important effects on metabolism. It’s action activates AMPK. AMPK is another really important signaling molecule that we understand much more about. For now, its just important to know that AMPK regulates fat metabolism, and it looks like treatment with MOTS-c actually prevents obesity and insulin resistance in mice. Maybe this represents a future treatment for obesity and diabetes? It’s actually quite strange to think that someday we might understand endocrinology well enough to regulate weight and even to some extent processes like aging by simply hormone injections without the current negative consequences that generally accompany these approaches. That day is not yet here, so I’m gonna go hit the gym. Lee, C., Zeng, J., Brew, B.G., Sallam, T., Martin-Montalvo, A., Wan, J., Kim, S., Mehta, H., Hevener, A.L., de Cabo, R., Cohen, P. (2015) The mitochondrial-derived peptide MOTS-c promotes metabolic homeostasis and reduces obesity and insulin resistance. Cell Metabolism 21, 443-454. Although most of my friends have, or are currently working on, graduate degrees of some kind, most people don’t achieve this level of education. Shocking, I know. Following a discussion about why I think it’s important for people without high school educations to work on their GED or pre-GED even if they don’t think they’ll be able to finish the entirety of it, I looked for research on it, the way I do. What I found generally supports my opinion, but not completely. 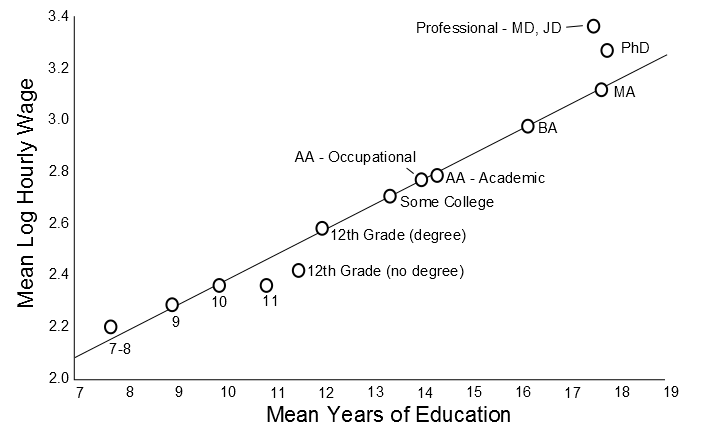 At least according to David Card (1999) in the Handbook of Labor Economics (1), it looks like if you have a 8th grade education, it makes sense to try for a 9th, and from there a 10th, but after that, unless you actually get a high school degree, it might not be worth it to pursue more education (Figure 1). Mean log hourly wage as relating to mean years of education (modified from 1). Interestingly, the trend continues with college. It’s worth it to go to college, even if you don’t even get an associate’s degree. But an associate’s degree is even better, and a bachelor’s degree is better yet. Lastly, I guess most people who do a Master’s of Arts degree take almost as long as a PhD, and both take longer than an MD or JD (lawyer degree). So, perhaps not shockingly, neither a Master’s degree nor a PhD are really worth the years of enslavement relative to becoming a lawyer or a medical doctor. But we do it because we value education for it’s own sake, right? And because not all of us can look this good in scrubs. Just kidding, I look awesome in scrubs. 1. Card, D. (1999) The Causal Effect of Education on Earnings. Chapter 30, Handbook of Labor Economics, Volume 3, Part 1. Page 1808.